Attendees of the American Public Works Association Arizona Chapter luncheon on Weds., May 16, got a fast-paced and furiously detailed state of the public construction market overview and its impending changes from AZBEX Founder and Publisher Rebekah Morris. After reminding everyone that, while Capital Improvement Project plans are public documents, as internal planning guides they are not written for easy public consumption or understanding, she gave a quick overview of AZBEX’s research work in the area over the past seven years and of the state’s economy as it exists today. Even though the state’s economy is, in her words, “Humming along,” and even though revenues are exceeding earlier projections, the upcoming five-year CIP aggregate totals are down 2.96 percent year-over-year. 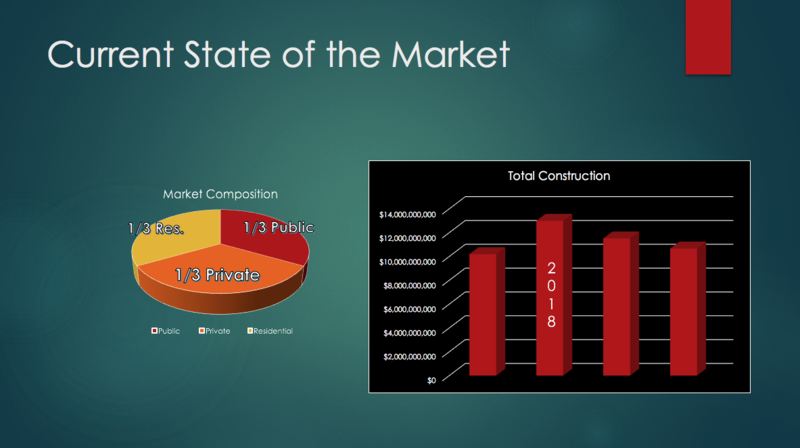 The total construction market in the state is currently nearly equally divided across the three primary sectors: Residential – both single – and multifamily, private construction and public projects. 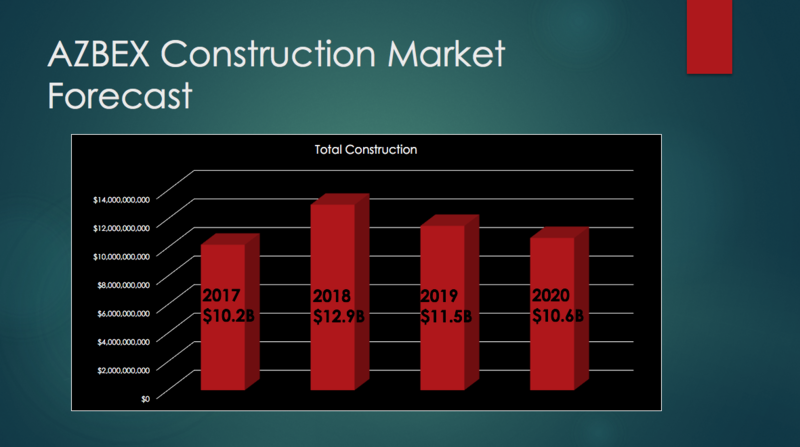 2018 will be a peak year, with total construction activity of $12.9B, Morris said. However, 2019 and 2020 will start tapering down, with activity of $11.5B and 10.6B, respectively. 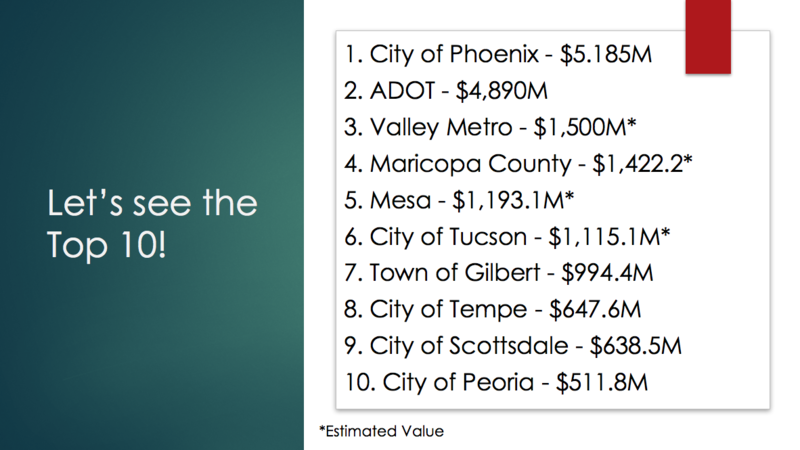 One major change in the list this year is the change in the top two positions, with the City of Phoenix ($5.185B) overtaking Arizona Department of Transportation ($4.89B) for the first time in several years. ADOT’s displacement from the number one position drew several surprised reactions from around the room. Noting that a decade ago the market was significantly overheated – for example, Phoenix had a CIP project list of $7.2B in 2007 – Morris advised the attendees that things have been remarkably steady over the past several years. “Since 2013 we have been really consistent,” she said. “Then, you see things pick up in 2015-2017, and now it’s kind of taken off like a shot. My conclusion is a $5B program is where it should have been all along. I don’t think anybody wants to get back to 2006-2007 levels of activity. It’s too busy. It’s overheated. Moving to ADOT, Morris noted the department’s federal funding had been “incredibly stable” over time, partially due to the Fixing America’s Surface Transportation Act of 2015. Touting the “bright side” of ADOTs plans, she referenced several major projects, including the I-10/I-17 Split/Loop 202 SanTan ($525M), SR30, I-10 – SR303L/SR202L South Mountain Phase I ($339M), and Design/Build I-17 – Pima Road ($152M). After reviewing projects of note from various agencies, Morris moved on to a market analysis showing procurements in 2012, 2015 and 2018, noting what percentages came in at, below or at higher cost than bid, comparing engineer’s estimate to contracted value. 2012, she noted was a time of aggressive bidding. Two-thirds of the six available data point projects came in below engineer’s estimate, and ones that were higher, were only slightly higher. In 2015, 22 projects were located. Twelve (45%) came in with bids less than the estimate, one was on track, and nine went for higher cost. “We still had a lot of projects coming in under estimate with very aggressive, very opportunistic bidding. She then talked about factors driving costs up, including the ongoing labor shortage and rising materials prices. “These guys that are coming in under estimate have a hole. They have something they need to fill; maybe a project got cancelled.” She noted many projects are going out for rebids, particularly on the private side, in large part because when projects were budgeted and proposed three-to-five years ago, today’s costs weren’t envisioned, and contractors are having difficulty meeting those numbers due to current market forces. One issue to address is the lack of diverse engagement between planners and the market. Morris said, “When an agency is overly locked in with their favorite contractor or engineer, you could be stuck. If you only use one or two, you might have a situation where those one or two people are suddenly very busy and aren’t there. You have to make sure to connect with the market, make sure your numbers are right, make sure the market knows your projects are coming, make sure you have active engagement with contractors and vendors.